With the middle of the Fall semester upon us, many research and instruction librarians find themselves in the thick of instruction season. Whether it’s credit-bearing information literacy courses or one-shot workshops, it’s safe to say our library classes are in full swing. The importance of generating and connecting related terms for keyword searching is just one of the skills frequently included in library instruction sessions. However, some students are easily frustrated in their quest for coming up with related terms; they may get “stuck” on what they consider a “perfect” term, or they may simply lack mastery of the required language skills necessary to imagine related key terms without additional help. Librarians already employ a number of instructional techniques to help students brainstorm and generate keywords, including consulting reference materials, using group brainstorming, and identifying key terms from a related book or article. An additional tool librarians may consider incorporating into keyword instruction is a visual thesaurus like Snappy Words. Snappy Words is described as a free “online interactive English dictionary and thesaurus that helps you find the meanings of words and draw connections to associated words.” Basically, search for a word to two-word phrase in Snappy Words, and you’ll receive a visual, clickable map of related terms. Your map is generated based on Snappy Word’s search of the Princeton-developed WordNet lexical database. The database uses lexical relationships between words to group terms, and this data is displayed when you search Snappy Words. Searching Snappy Words is very simple. Enter your word or phrase into the search box and click “Go.” Snappy Words searches its database to create an interactive word map of synonyms and related terms. You can then zoom in or out on various portions of the map, click and drag the terms to explore relationships, and hover over terms to see definitions. Although the site includes advertisements and links for other companies, using Snappy Words requires no registration, log-in, or other personal information. It is also worth noting that Snappy Words requires Adobe Flash, and therefore cannot be accessed on some mobile devices. 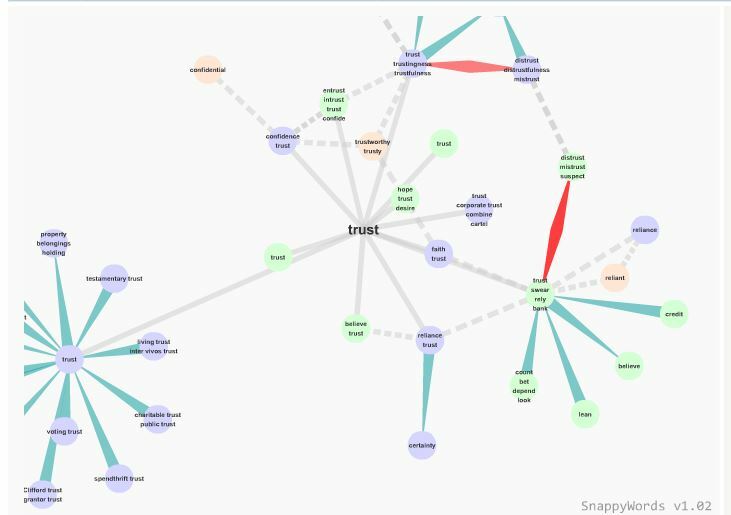 In addition to the map of related terms, Snappy Words provides a graphical representation of additional language features, including the parts of speech for each word and how the words are related to each other. The connections in Snappy Words demonstrates how the terms are related. 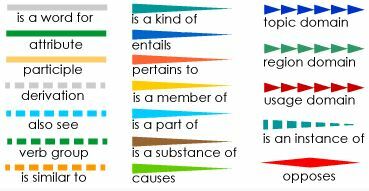 Terms are color coded based on the parts of speech, while the connecting branches between associated terms indicate the relationship. For instance, a solid grey line shows that the terms are synonymous; the dashed grey line connects terms that are derivations of each other. The language-related features of Snappy Words, including the term relationships information and definitions, could be useful in library instruction sessions when demonstrating how the keywords you choose for a given search can influence the types of results you receive. Snappy Words seems most useful for terms that are common English-language terms, and not necessarily discipline-specific terminology. And the look and feel of an interactive thesaurus may appeal to learners who prefer to navigate and express ideas in a more visual way. Librarians know the results from a database search are only as good as the search terms the user chooses. Helping students understand the importance of finding and choosing the correct keywords continues to be an important aspect of instruction and reference interactions in academic libraries. Will you be giving Snappy Words a try to spice-up your next keyword lesson?